For this project, an Engine Control Workstation will be designed to simulate the thermal environments found in cooling systems. 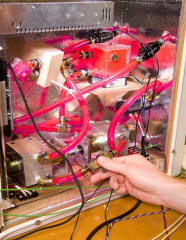 The workstation will allow users to design, test and implement controllers via Matlab GUI to more precisely regulate the thermal dissipation of a motor-generator system with the goal of reducing energy use. Code will be auto-generated within the same program with the processing of the data being done on a DSP board. Motor side GUI now has user control of gain as well as the control type desired -Proportion, Proportional-Integral, and PI with Feed Forward available. Thermal side Simulink model has been updated to include thermal power efficiency. A Progress Presentation was given to faculty members. The Power Point has been uploaded. Feed Forward Control is now available as a motor controller. Motor side transient response can now be seen in the GUI. P and PI Control have been completed for the motor. PWM percentage and motor RPM can now be viewed in the GUI. Thermal side transfer function is now being obtained. Project presentation proposal was given to professors and Design Review Teams. The final project proposal was also submitted. The presentation and proposal have been uploaded. The final performance specifications have been created and uploaded. The project Functional Description and System Block Diagram have been created and added to the site. The motor and thermal cooling system for the Workstation. Copyright © Mark Bright and Mike Donaldson Bradley University. All Rights Reserved.